» SEPA: WWII Vet Honor Warriors' Watch Riders: WE HAVE YOUR BACKS AT HOME! “WOW! What a gathering. I don’t know what to say. Thank you, everybody.” Those were the words of Sgt. John T. Briley as he was interviewed by a local Press Agent. WOW, is right! What a wonderful turnout to honor this World War II Vet. The air was a little chilly, but the wind died down. For February, I would say it was a pretty good day. The Warriors Watch Riders came out to show respect for Sgt. Briley, and to shake the hand of this American Hero. We had a few Cages and even more Bikes! Abington Police Department had two of their finest out to help lead the parade to Sgt. Briley’s house. The Bikes were next, followed by the cages and then the Fire Trucks. Weldon took the lead on that end, with two pieces of apparatus. The Weldon Fire Police followed, and LaMott Fire Company kept our ‘back door’ safe. Channel 6 and Abington News & Reviews covered the event. 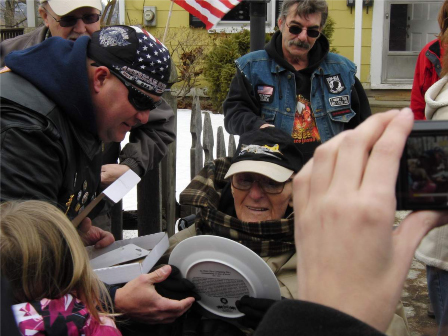 Our hats go off to the members of various organizations that were on hand to thank John. As we approached the house, the family was overwhelmed with the turnout. Neighbors lined the streets and John came out to meet everyone. He was all smiles as Chief Mulligan from LaMott Fire Company presented him with a bag of goodies and a well deserved Thank You for his past service to LaMott Fire Company. The members of both Weldon and LaMott Fire Companies shook John’s hand and thanked him. A Hero’s Welcome was next, with a presentation of a certificate of appreciation and a hug and kiss from Maria. “I think Grand pop liked the kiss more than the certificate,” Mark, John’s Grandson said. Then The Riders were next. The words that they whispered into his ears were very meaningful and heartfelt. Some of the WWR members realized that they knew John and his son from the past. Some grew up near the Briley’s and some have run across his path, over the years. Well, the family was just overwhelmed. As I sat in the house, exchanging stories with the family, I watched Grand pop’s face lighten up. He truly did enjoy this event. He had a few of his own comments…and corrections…to some of the stories. Yep, he is still sharp. And then it was time for us to leave. The family was so happy to have gotten together and spend quality time with each other. This is so valuable, you never know what tomorrow will bring. As for my Grandfather…tomorrow brought another day, and a reason to wake up early and tell the nurses aid about the whole event. She could not believe how much he remembered and how much it meant too him. The smiles were awesome. While we were thanking John, we Met another Vet. He was a member of the LaMott Fire Company. He was a three tour, Purple Heart recipient, from a much later era. What a surprise to be able to Coin two Vets at the same event. Wait, that’s not all. Some of our members went to a local Diner after the event, where they were introduced to another 90 year old Vet! WOW! Are you kidding me!? This Vet was coined and the Three peat was completed! Could a day get any better than that. Three Hero’s in one day. Well folks…my brothers and sisters of Warriors Watch Riders…Thank You, from the bottom of my heart…for making my grandfathers day so special. No user commented in " SEPA: WWII Vet Honor "